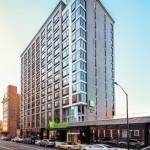 Free Wi-Fi plus an on-site restaurant and indoor pool entice guests at the non-smoking Holiday Inn Brooklyn Downtown which is two blocks from the nearest subway. The non-smoking Holiday Inn might surprise guests with its sleek contemporary exterior design which continues in the modern details of the 245 rooms. Its 14 floors also contain a restaurant with a bar and room service an indoor pool a sauna a hot tub and a gym. All rooms feature free Wi-Fi HDTVs mini-fridges and coffeemakers. Stay in touch with the office using the business center and make the most of the hotel's other convenient perks such as laundry facilities free newspapers and available parking. Pets are allowed in some rooms for a fee.There are plenty of shops restaurants and public transportation options within a few blocks of the Holiday Inn which sits less than two miles from the iconic Brooklyn Bridge. This borough has an array of sights including green spaces like the Brooklyn Botanic Garden in Prospect Park and cultural stops like the Brooklyn Museum all within two miles. Guests travel a half-hour to reach Manhattan's Theater District the Empire State Building and Central Park. LaGuardia is the closest airport 10 miles away.